In this imposing portrait, Jacopo Bassano applies a vigorous and sharply focused naturalism to portray the distinctive features as well as the spiritual temperament and preoccupations of an unidentified Franciscan friar. The skull, a reminder of the vanity of earthly life, supports the contemplative aspect of the friar’s piety, and the pen holder that hangs from the rope at his waist attests to his learning. A sensitive colorist, Jacopo creates a rich tonal range, contrasting the cool gray of the wool habit with the warm flesh areas, which derive luminosity from the reflection of the white ground through the glazes. Portraits of Franciscans, who avow humility in a life devoted to prayer and penance, are not common. This early work is datable to around the time that Jacopo painted the Saint Anne altarpiece (1541, Gallerie dell’Accademia, Venice, on deposit in the Museo Civico, Bassano del Grappa) for the church of the reformed Franciscans in Asolo; possibly the sitter was one of its members. 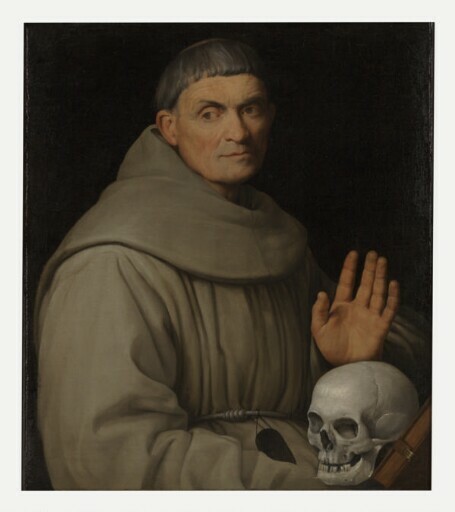 Portrait of a Franciscan Friar, which once belonged to the Marquess of Lansdowne, is one of three works in the Kimbell from the Earl of Shelburne’s historic collection in Bowood House, Wiltshire. The others are Domenichino’s Abraham Leading Isaac to Sacrifice and Jacob van Ruisdael’s Rough Sea at a Jetty. by descent to Salvatore Orsetti [born c. 1744], Venice, to 1803, as Giacomo Bassano. purchased through (Simon Dickinson Ltd., London) by Kimbell Art Foundation, Fort Worth, 1997.